Lever platforms with a single load cell, suitable for weighing metal sections, rods, pipes and plates in industrial and commercial applications. Standard version is with approved load cell. Functions with 1approved load cell protected against dust and water splashes according to IP65 standards and with OIML certification (350 Ohm input resistance). 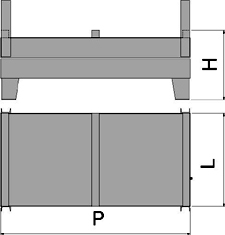 Sturdy painted steel section structure, and load surface with support bars, fixed edges, and flip-down edges on the operator side. Levers, cutters and bearings are in hardened ground chrome steel. Platform oscillation on steel balls and oscillation locks for avoiding overturns. Front series tubular for easy handling of the scale with a forklift truck. IP67 hermetic junction box and wiring with 5m long 6-pin cable with connectors for connection to the indicator. for the complete protection against scratches and bumps during transportation. The iron-weigher SW is shipped inside a sturdy wooden case which is custom made. This special service is included in the price of the product. BR3K Extractable extensions, for iron-weighing scales from 1500 to 3000kg. l= 50cm per side. BR6K Extractable extensions, for 6000kg iron-weighing scales. l= 50cm per side.